The closure and stem are molded in one piece to make them leak proof. The angled neck and tip provide a uniform stream of liquid and the tip can be cut back if required to increase the flow. A wide bottled mouth makes filling easier. 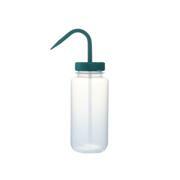 The bottle is made from LDPE with a PP closure.